Good news everyone! I’m done with the site, so go ahead and take a bite. Oh, whats this? I am a poet, and I didn’t even know it! Hello and welcome, this is your new webmaster jamiejakov speaking. I have been hard at work creating a site fitting for an anime group which is a gathering of all the anime groups. Yo dawg, I heard you like groups, so we made a group for your group so you can ….. Sorry, old meme. You might be asking: “why?”, “where do I look?”, “whats new?”. Why? Because it’s red. Go and explore there are 5 sections with information about the group, our members (clubs), the sponsors and of course our band. Whats new? well pretty much everything, from the HTML/PHP to the CSS (thats not that much, I know) is all new and custom written. 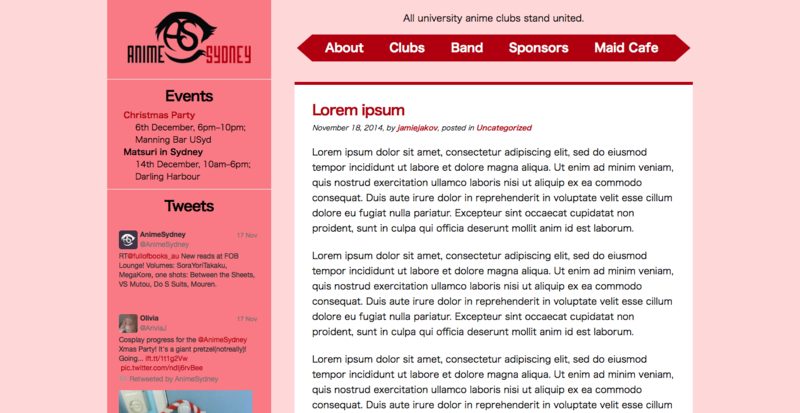 So without further ado, welcome to the NEW AnimeSydney.